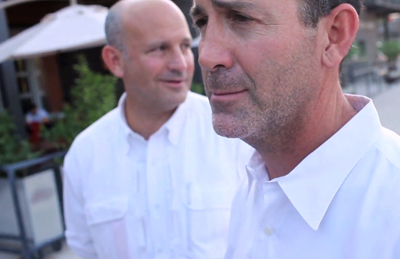 Web extra: Take a video tour of Henderson Avenue development with Marc and Roger Andres. It seems so damn Dallas: I'm with the Andres brothers, Marc and Roger, and they've agreed to give me a brief tour of their holdings on Henderson Avenue—one of the more walkable neighborhoods in the city—and we are driving. We have just finished a lengthy interview on the second-floor offices of Andres Properties, conveniently located at a midway point on the 1.1-mile narrow strip of tree-lined street that connects the 35 restaurant and retail properties they own, developed, lease and love. The street contains some of the trendiest scene-driven restaurants in Dallas—Park, The Porch, Soley! Sushi Axiom—and some of the busiest neighborhood bars—Old Monk, Capitol Pub. But it's late August. It's ridiculously hot. Getting out of the heat and into a car is as natural in Texas as gas. Like other sectors of the economy, commercial real estate in Dallas has taken a beating. Hillwood turned over the keys to its Victory Park development to German investors, occupancy rates at shopping malls are plummeting and restaurant closures fill the entries of food bloggers. Yet the Andres brothers, who own about 80 percent of the retail and restaurant space on Henderson, say they rarely lose tenants, and they project that in 2009 the street should do $60 million in sales, up from $10 million just three years ago. "Last Saturday and Sunday, we had 14 calls on our voicemail of people wanting to get on Henderson Avenue," Marc said earlier. "A lot of people want to be in this area." I pepper them with the same line of questioning: Why Henderson? Why now? Why them? They seem uncomfortable answering, getting all modest on me, and saying that none of this could have been possible without a confluence of contributors: restaurateur Tristan Simon for one, who took a risk in 2000 by opening Cuba Libre (not Andres property) on Henderson Avenue, which was still a transitional neighborhood. He followed with two nightclubs and four restaurants, including Fireside Pies (2004) and The Porch (2007) on property leased from the brothers. Blake Pogue of Phoenix Property Company was also a game-changer. In 1999, he began building apartments and condos in the surrounding neighborhood, offering restaurants and retail, both existing and prospective, some much-needed density so people could live where they played. But isn't that integral to their success—the new urbanism concept of walkability? Singles and couples without children, attracted to housing close to downtown rather than the suburbs, coming home from work, strolling to dinner, drinking a beer on the patio of their favorite neighborhood bar, no cars—and no cares about getting a DWI. The Andres brothers tell me that yes, walkability was exactly what they were going for, only they didn't know it when they started because the term hadn't been coined yet. What they did know from the time they were young boys was Henderson Avenue. They drove up and down the street with their father, tagging along as he met with tenants of the income-producing property he owned. Until the 1970s, their father had run a family grocery business on the outskirts of downtown, which closed when the city condemned the property to build Woodall Rodgers Freeway. Then he plunged himself into the real estate business full-time, buying property housing mom-and-pop shops, 7-Elevens, gas stations—many along Lemmon and McKinney Avenues, Lower Greenville and Henderson. In the mid-'80s, Marc and Roger joined their father's business. While many of their real estate friends focused on the new, developing "primary corners" of shopping centers and leasing to national credit tenants such as the Gap, what excited them, they say, was stripping their father's properties down to their 1920s selves and making them look new again. "We wanted everything to remain organic. For the most part, everything would be brick and natural materials," Marc stresses. "We didn't want a Starbucks on Henderson, or a Brinker concept like Chili's, something you could see on any corner of the city. We wanted everything on Henderson to be one-of-a-kind." From revenue generated by selling their holdings in the Bishop Arts District, they purchased more property on Henderson and by September 2006 had gained a critical mass of land that enabled them to control development on the street. "Everything we do is intentional," Marc says. "We strategically slot the tenants, and we don't do conflicting uses. You won't find two yogurt shops on the same block, or two Italian restaurants. If we don't have the right tenant, then the space will stay vacant until the right one comes along." It seems to be working. On our little tour after we finally get out of the car, the Andres brothers aren't just recognized by their tenants, they're celebrated by them. Valet parkers go out of their way to make eye contact and wave. Operators at Sushi Axiom, Veritas (a wine bar) and Urbino (pizza and pasta) extend hearty handshakes. "The Andres Brothers are on the street all the time—they are very involved participants," says Brooks Anderson, who owns Veritas with his brother Bradley. "When you see all the crowded patios on a Friday or Saturday night, the eclectic crowd, the energy, you know they have cobbled this thing together in the right way." Though the density from the nearby apartments isn't where they want it yet and they suffered a setback when a neighborhood group beat back their efforts to transform a former Hispanic grocery store into a mixed-use development that included 250 apartments, there remains an undeniable momentum to Henderson Avenue that appears to defy economic slumps and bumps. There's also a feel to the street that it is authentic, almost soulful, a sentiment that the Andres brothers are not just helping build a sense of community, but a community outright.